I attended a play Thursday at the San Gabriel Mission. When I first read the invitation to attend this special performance put on by the East L.A. Classic Theatre Group (http://www.eastlaclassic.org) and the City of San Gabriel for students in local districts here in the valley, I was very intrigued and knew I had to go. The theatre group performs classics such as Shakespeare’s”Much Ado About Nothing” and “Romeo and Juliet”, but adds a unique twist to each of them. As Tony Plana, artistic director and star of TV’s ‘Ugly Betty’, explained it to me, they like to integrate different cultures and ethnicities into their plays and adapt them to themes and locations that are more familiar to the students and local community. Thursday’s play was an adaptation of “Much Ado About Nothing” – Mariachi Style. The classic story was set in 1862 in the city of Puebla just after the Battle of Puebla, or Cinco De Mayo as most people know it by. The play had the basics of the story – interracial relationships and marriage, gossip – but a little updated and featured Mariachi music songs and with Anglo gold miners and Mexican soldiers as the lead characters. This definitely made the play more fun and interesting to watch and as far as I could tell, the students were not bored by it at all. The actors portrayed their characters so well and were able to get the students very engaged and involved in the storyline and the message of the story, making it a more memorable and fun experience for them. And for me too. I thank everyone at the mission and the theatre for inviting me to a wonderful event. It was such a pleasure meeting Tony Plana, I’ve admired his work for a long time, and I love what he and the theatre group stand for. The theatre group held the performances for students Thursday and today, Friday, coming from San Gabriel schools and a San Gabriel senior group as well as schools from El Monte, Montebello and more. But they are also offering a free community performance Saturday evening at 8 p.m. that is open to everyone. If you have the time, I would suggest trying to make this special performance. Check the theatre group’s website above for more information about the group and call (213) 300-5871 to reserve a seat. On Thursday night at 7 p.m., Mt. Sierra College will welcome guest speaker Michael Gilmartin of Blizzard Entertainment. As global quality assurance director for Blizzard, Gilmartin is the man behind such games as World of Warcraft, Diablo II, Starcraft and more. Gilmartin has been involved with numerous franchises such as World of Warcraft, and others like Unreal Tournament, Neverwinter Nights, Tomb Raider, and Sid Meiers Civilization. Working nearly 15 years in the gaming industry, Gilmartin has worked with companies like SEGA of America, Inc., Eidos Inc., Maxis Software, Inc., and Atari, Inc. and more. Mt. Sierra College is located at 101 E. Huntington Dr., Monrovia. For information and to RSVP, call Angie at (626) 873-2166 or Kellee at (626) 873-2100. You can really count on these guys! Congratulations to the Alvarado Mathcounts team at Alvarado Middle School in Rowland Heights for winning second place in Saturday’s regional competition at Cal Poly Pomona. They missed first place by only one point. The Alvarado students came in second out of 13 teams and will advance to the state competition at UC Irvine on March 15. 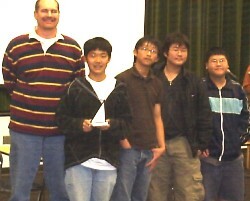 Kyle Miho, second from left, won first place in the competition, beating out 88 other students. He missed only one problem in the whole contest. Miho is the first student in school history to get a perfect score in the Mathcounts Sprint round answering 30 problems correctly. Hundreds of Bassett High School freshmen and sophomores participated in the school’s annual Career Fair on Monday, Feb. 25. Dozens of career representatives from the surrounding community were on hand to counsel students on career choices and options for their future. Representatives from the L.A. County Sheriff’s and Fire Departments were on hand, as well as the county coroner’s office, the California Highway Patrol, military branches, technical schools and more. Bassett’s counseling staff, high school elective teachers, and upper level students were also on hand to assist 9th -and 10th- graders in making decisions on selecting a career path to pursue while still in high school. 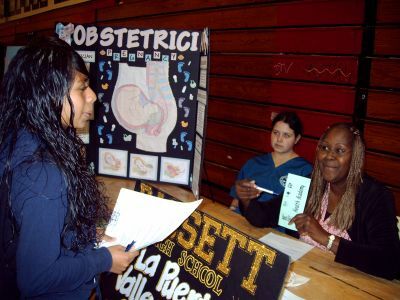 teaches classes in Bassett’s health care academy on the high school campus. class at Bassett along with representatives of the ASB. decisions for next year during registration in March. Bassett High School is part of the Bassett Unified School District. I am currently working on a story coming out of the Montebello Unified School District. The district rehired David Miranda – a former employee with four drunken driving convictions – as an employment specialist for the district on Thursday. Miranda is the nephew of Montebello Councilmember Rosie Vasquez. The school board approved the re-hire which is a bit unusual for them to vote on a non-certificated position. They typically vote on certified positions such as teachers and administrators. This leaves some to believe that the re-hiring of Miranda might not be welcomed by everyone at the district. Miranda is currently serving a four year probation which includes having his drivers license suspended for two years, serving 15 days in county jail, and serving 18 months in an alcohol rehabilitation program. Character counts! That why our schools do much more than teach the ABCs. In this case, California Elementary School is teaching the ABCs of Character at a special assembly in the West Cafeteria at 10:15 a.m. Tuesday. An ABCs of Character meeting will be held for parents at 6 p.m. in the West Cafeteria of the La Puente school. Glad to see the Hacienda La Puente Unified School District is teaching the whole child. Where do high school students apply for college? Arcadia High School offered students a chance to tour various Ivy League and other Northeastern universities this Spring (see article), then discovered that they couldn’t round up enough students to make the trip happen. College Counselor Laurie McQuaid complied some interesting stats about which colleges the students apply to, where they’re accepted and where they ultimately attend. The most applied-to and most-attended colleges were UC Irvine and UC San Diego. But what was even more interesting to ponder the acceptance and attendance rates at some of the elite schools. Sixteen students applied to Caltech and both of the students accepted there wound up attending. None of the 13 who applied to rival MIT got in. Similarly, 16 applied to Yale. Two were accepted, but none went there. At Princeton, one of the 11 students who applied got in, but that student didn’t attend. Other students were accepted to Brown, Dartmouth, Columbia, Georgetown and Boston College, but wound up not going there. It makes me curious along with McQuaid, who said, ““Did they not realize that it snows (there)? With the help of movies like ‘Akeelah and the Bee’ and the televised broadcast of the Scripps National Spelling Bee, the Spelling Bee phenomenon is growing and everyone wants to take a part in it. I attended Mountain View School District’s second annual District Spelling Bee Thursday afternoon at Madrid Middle School in El Monte. And even though it’s been over 20 years, it brought back memories of when I was in a district spelling bee in the Los Angeles Unified School District. Back then, it wasn’t as big of a deal as it is now. But I’m glad it has grown since, it’s fun and a way for students to participate in something exciting and educational. I’m glad I was able to take part in something like that at a young age. Alot of my memories are fuzzy, but I remember winning a spelling bee in my grade level, moving on to the schoolwide contest and then moving on to the next level, which meant I was going to visit another school for the next competition. I remember feeling excited about something outside of my school, it felt like it was something bigger than me, bigger than the school. When I saw the students at the competition on Thursday – sitting up there, confused, nervous and anxious, I empathized with them. I actually did know what they were feeling at that moment. I remember the butterflies in my tummy when I know my turn was coming up and I’m trying to focus but the hundreds of words I practiced beforehand are getting all mixed up in my brain. Stepping up to the microphone, trying to drown out the fuzzy noise in my head, as I try to listen to every syllable in the word that is given to me. Then trying not to trip over my dry tongue as I repeat the word without thinking, and attempting to spell it as I keep repeating it in my head, syllable by syllable, to make sure I didn’t miss anything. And the relief I felt when I didn’t hear ‘incorrect’, so I could keep going to the next round and closer to the grand prize. But of course, I got my 15 minutes of fame in the spelling bee world, and was eliminated after the fourth or fifth round. I remember thinking I would never forget that word I misspelled that fateful day years ago. But I guess it was just too much for me at the time, and things got fuzzy after that, that til this day, I still can’t, for the life of me, remember what the evil word was! Yes, at the time it was an evil word for me. Just like ‘flippant’ will forever haunt the second place contestant in Thursday’s spelling bee. The winner will move on to the County Spelling Bee and who knows? Maybe we’ll see Isabella Coita, 10, in the next National Spelling Bee. As for me, I’ll settle for being a Scrabble queen! Kelly Gile of the Walnut Valley Unified School District told us about an event that promises to make math a family event. Tonight, third- and fifth-graders at Collegewood Elementary School in Walnut and their parents will learn how to practice math together at home. Cal Poly Pomona students will lead the workshop, which, according to Gile’s e-mail, will involve solving math equations and playing games. The workshop will be held from 7 to 8:30 p.m. in the multipurpose room at Collegewood, 20725 Collegewood Dr. in Walnut. Mt. SACs Financial Aid Department will once again offer free one-on-one financial aid assistance to high school seniors and their parents during its Cash for College workshop on Saturday, Feb. 23, from 9 a.m. to 2 p.m., in the Student Life Center, Building 9C. 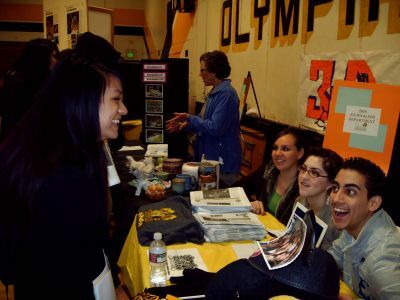 Cash for College provides one-on-one assistance for college-bound students and their parents to complete and file Federal Student Aid and Cal Grant financial aid forms for the 2008-09 academic year. The event also helps students maximize their financial aid prospects by meeting the early financial aid deadlines. The state financial aid deadline is March 2. Parents and students must bring a copy of students Social Security cards or permanent resident cards, and a 2007 federal 1040 tax return and W-2. If 2007 information is not available, a 2006 tax return may be used. The workshop information and assistance can be used to apply to any community college, not just Mt. SAC. Information and application forms will also be available for Admissions, Extend Opportunity and Programs Services and Mt. SACs Summer Bridge Program for first-time college students. A free continental breakfast and lunch will be provided, and reservations are necessary for one-on-one appointments. Participants will also be eligible for a $1,000 scholarship sponsored through the California Student Aid Commission and The Education Financing Foundation of California. To make a reservation or for more information, call the Mt. SAC Financial Aid Office at (909) 594-5611, ext. 4458 or 5972.